In keeping with the tenet of “early introduction to patient care,” optometry students begin conducting comprehensive vision screenings on children in the local school district by the fifth week of the program. Students screened range from kindergarten through 10th grade, giving each optometry student a wide range of experience as they start working with patients. During vision screenings, optometry students perform a symptom survey, evaluate the vision, focusing system, binocular status, color vision, depth perception, complete autorefraction and other testing to identify children who may have visual problems that can interfere with learning. Each optometry student participates in seven school vision screenings and screens approximately 35 school children during the fall semester of the first year. Western University of Health Sciences College of Optometry’s progressive approach to education affords our students with an exciting and challenging clinical curriculum. The Clerkship program is a distinctive clinical educational experience that creates opportunity for early entry into patient care. First and second year optometry students are placed in select local optometric and ophthalmologic practices for six, eight-week rotations, where they learn from some of the premier preceptors in our community. Each rotation is designed to maximize hands-on participation and allows the student to practice and observe compassionate and comprehensive patient care in a real life situation. 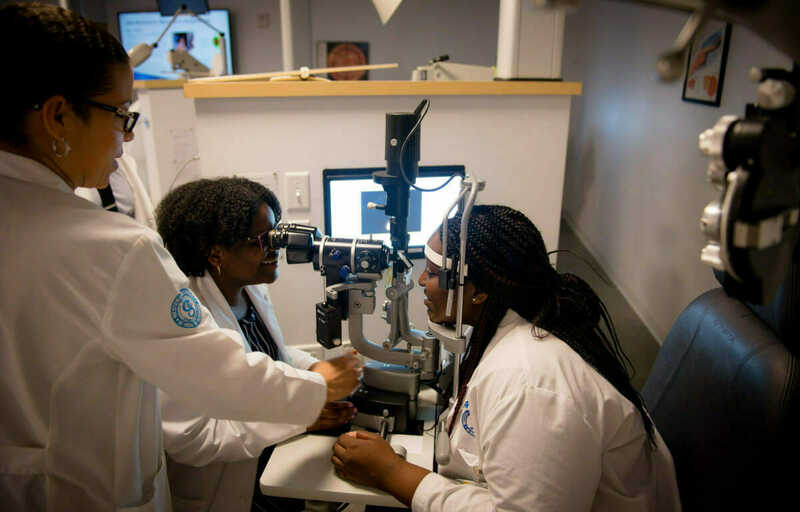 Students select from diverse sites, whose practices provide primary care optometry and rehabilitation, including vision therapy, neuro-optometric rehabilitation, and low vision rehabilitation. Students’ formal optometric education culminates with the fourth year externship. During this time students broaden their clinical experience at mainly off-campus sites. Throughout the four quarters students rotate through four sites that provide exposure to a variety of clinical settings, including private optometry or ophthalmology practices, Veterans Administration clinics, Indian Health Service clinics, armed forces facilities, as well as WesternU specialty clinics. These practices provide a diverse patient experience, emphasizing patient management in primary care, vision rehabilitation, pediatrics, ocular disease, and surgical co-management. Optional international sites provide students an opportunity to explore locations beyond the borders of the U.S. By the time of graduation students reach proficiency in full-scope optometric practice, preparing them for primary care clinical practice, residency training, and licensing anywhere in the U.S. and Canada. At the present time the Western University of Health Sciences College of Optometry does not sponsor any internal residency programs. Graduates have been highly successful in matching with residency programs elsewhere throughout the United States.